To Love a Rose: I-600A Approved! 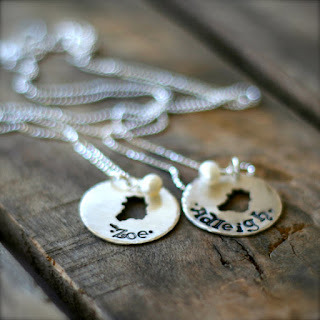 I really want this South Korean adoption necklace from The Adopt Shoppe on Etsy! It feels like time is moving so slowly with the adoption. I know waiting is the hardest part, and I know that God is always working on patience with nearly ALL of us adoptive parents. It's also not easy to read articles like this. Even though the overall consensus is that South Korean adoption is still moving in a forward fashion, it is hard for me to hear that the country is wishing to shut the program down altogether. Now, please, don't misunderstand me: I am VERY glad that South Korea is getting to a point where they no longer need international adoption; but when you have waited as long as we have for a child and been through as many country programs and treatments to no avail, it's hard to be happy that the very program your child is coming to you through is trying to stop doing the one thing that will FINALLY make you a parent. I can't help but get a twinge of fear every time I get an e-mail from Holt about the Korea program. Even more difficult is the fact that while referrals are coming in at a regular pace, EP's (emigration permits) are now on quota. This means that while most families get referred (matched with) their son or daughter within 6-7 months, they often have to wait 12-18 months after that point to get the "okay" from Korea to bring their child(ren) home. *tears* We are praying and believing that this will NOT be the case for our little one; but if it is, we have to believe that God has a reason for this and that he (because it's 99% certain it will be a boy) will be well taken care of while we cannot reach him. Deep in our hearts, we KNOW that God sees our utmost desires; and that He loves us enough to care that they come true. God IS knitting our family together, and we know that He is in control of this entire process, no matter how frightening or uncertain it seems at times. The human side wants us to feel afraid and weak and powerless, but the spirit is saying, "Trust in the Lord your Abba God, for He is preparing your path and raining down FAVOR upon you and your future child!" AMEN! All this being said, we got some good news today. Our I-600A (application for advance placement of an orphan) is APPROVED! Next, we get our fingerprints taken again, this time for the FBI. After this, we will receive our I-171H which is all we need to move forward with applying for the baby's visa and American citizenship! We know this doesn't seem like that big of a deal, but it is for us - everything checked off the "to do list" brings us one step closer to our child! We also found out the name of the pediatrician taking care of our child; which was pretty amazing. And we discovered that our home-study was approved on Valentine's Day (awwww! LOVE this!) and sent to South Korea to be matched with a child on February 17th. Referrals are coming within 6-7 months of home-study approval; so, I think we will get our good news by July (*fingers crossed*). Thank you to all of you who continue to pray for our adoption. Mr. C and I appreciate this more than you can ever know! We are so grateful that God continues to be faithful to His promises to us each and every day. We cannot wait to see what He has in store for our family and Baby C! So great to hear that you have been approved and are now just waiting for your referral! Congratulations to the new parents!